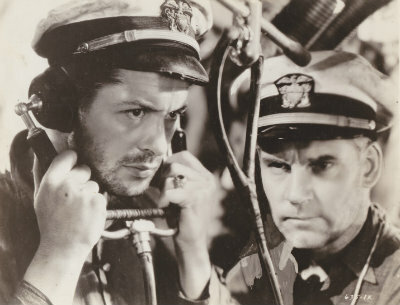 TCM will be showing SIX Robert Montgomery movies this month! That's just great of them. The more Bob's movies are shown, the more chance there is for some fortunate soul to discover our wonderful Mr. Montgomery. And it's a good variety of some of his better movies, from war movies to a fantasy (Jordan) to a comedy/mystery (Fast and Loose). Do note the beard on Bob in this still from Hell Below (1930), the first movie being shown. I have on occasion voiced my dislike of the mustache he wore in Trouble for Two (1936). (As in why mess with a perfectly handsome face!) But, the mustache and beard combination seems to work much better for Bob. I bet it took him just a few days to grow it. 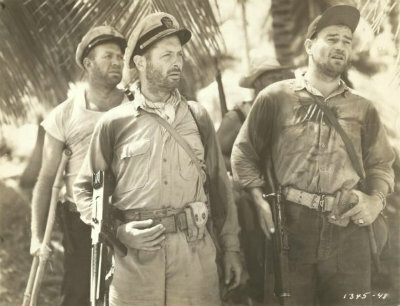 Bob gets to demonstrate his beard-growing talent again in They Were Expendable (1945), the next movie being shown. That's quite a full beard he has. Yes, a multi-talented man was our Bob. Nov 9 - Hell Below (1933) at 1:45 p.m.
Nov 10 - They Were Expendable (1945) at 5:45 a.m.
Nov 12 - When Ladies Meet (1933) at 10:45 a.m.
Nov 17 - Here Comes Mr. Jordan (1941) at 8:00 p.m.
Nov 25 - Fast and Loose (1939) at 4:30 a.m.
Nov 30 - The Last of Mrs. Cheyney (1937) at 9:30 a.m.